The page title says it all, we are looking for new people to support the Layered Reality Productions cause, so on this page you can find our official job descriptions that we are accepting offers for. 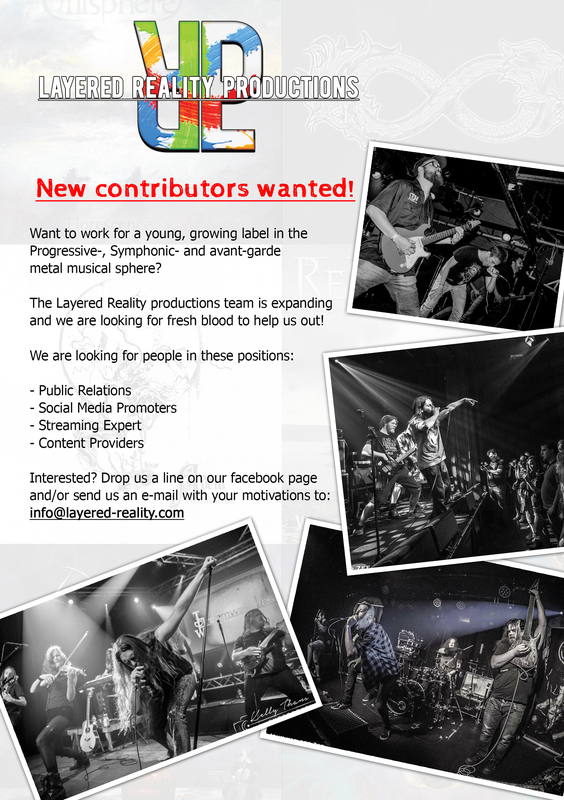 The Layered Reality productions team is expanding and we are looking for fresh blood to help us out! Feel free to send your resume and motivation to info@layered-reality.com and we will make sure that you get a reply from us. We are looking forward to your e-mails! The function names will guide you to the full description. As PR-contributor at Layered Reality Productions (LRP) you will be responsible for the main commuication with webzines, companies and other press instances that can add to the growth of the label. You will share promotional materials with websites and radiostations to expand the reach of the labels’ artists and bands. You will also be expected to get in touch with new websites and press options to promote LRP’s output. In short, you will be the direct point of communication and correspondence to third parties who are interested in working with LRP. –	Creating and maintaining contacts with webzines/magazines and other press instances. –	Approaching of new webzines/magazines, press instances for the promotion of the labels’ output. –	Maintaining and updating the address database. What can you expect in return from Layered Reality Productions (LRP)? Layered Reality Productions is a non-profit label from the Netherlands that focusses on Progressive, Symphonic & Avant-garde metal music. The team at LRP is young, creative and driven and everyone wants to contribute to making the label a bigger and better entity with each step taken. Perks include free access to gigs of LRP artists/bands, building a new set of contacts for your own network and a chance to grow within the scene in which LRP operates, but also beyond that. If you are interested in joining the team, be sure to send an e-mail with a motivation and a resume to info@layered-reality.com and we will get in touch with you asap. We are looking for social media promoters to help spread the word about our label and our signed bands. If you work as a social media promoter at Layered Reality Productions (LRP), you will be in charge of sharing LRP bands/artists’ audiovisual material on social media such as Facebook and Instagram. Additionally, you are expected to contact webzines, magazines and bands in order to increase LRP’s following and presence on social media. –	Actively spreading audiovisual material of bands/artists of LRP on social media. –	Actively correspond to messages on social media on behalf of the label and/or the bands/artists we represent. –	Brainstorming ideas to increase support for LRP and aid in setting up plans for these ideas. Layered Reality Productions is a non-profit label from the Netherlands that focusses on Progressive, Symphonic & Avant-garde metal music. The team at LRP is young, creative, driven and everyone wants to contribute to making the label a bigger and better entity with each step taken. Perks include free access to gigs of LRP artists/bands, building a new set of contacts for your own network and a chance to grow within the scene in which LRP operates, but also beyond that. As content provider at Layered Reality Productions (LRP) you will mainly be responsible for writing and providing news posts for fans on social media channels such as Facebook and Instagram. Furthermore, you will keep in touch with bands and artists signed at LRP in order to provide updates for the monthly mailing list. In short, your role as content provider is to keep fans up to date regarding developments of LRP bands or the label itself. –	Writing news posts and e-mails on new releases or other important updates of bands/artists or the label. –	Provide content in Dutch as well as English (more languages next to these are desirable). –	Maintain contact with all signed bands/artists of LRP to provide monthly news for fans. –	Setting up an HTML-based mailinglist which can be sent out to LRP mailinglist subscribers. As a streaming expert at Layered Reality Productions (LRP) your responsibilities consist of monitoring the streaming platforms on which we have uploaded LRP music. Your job will have a marketing aspect to it, because you are in charge of exposure of the bands signed at LRP by adding songs of LRP bands on as much progressive metal playlists as you can. Keeping in touch with people that create these playlists is therefore of great importance as well. –	Monitoring streaming platforms on which we uploaded LRP music. –	Updating LRP playlist on Spotify (A. A. B. B.) and promoting it on social media. –	Contact people that make playlists on Spotify/Apple Music in order for them to add LRP music to their playlists. –	Managing the streaming profiles of the label on the available streaming mediums.